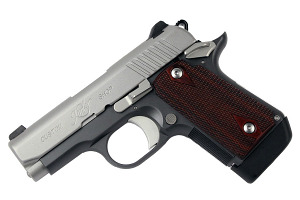 Compact, easy to conceal, and as natural pointing and ergonomic as a full size 1911, the Kimber Micro 9 CDP features mild recoil, smooth operation and consistent accuracy. Chambered in 9mm luger, the Micro 9 CDP has a 6 or 7RD capacity, 3 dot night sights, charcoal gray frame, matte stainless slide, 30lpi frontstrap checkering, ambidextrous safety, melt treatment, rosewood double diamond grips, and a crisp SAO trigger. Comes with one 7RD extended magazine.